The complex task of clearing out a property can be made easy by hiring the services of a professional company. 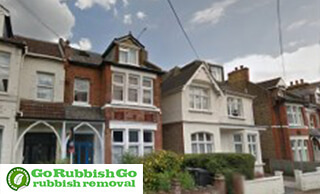 At Go Rubbish Go, we provide hassle-free Berrylands house clearance KT5 services to help people clear their properties of waste. Our efficient services in KT5 are everything that you need to clear items from both the interior and exterior parts of your home. All people in and around Berrylands can make use of our effective services which come at very affordable prices. So hire us if your home is cluttered up with all sorts of unwanted items. Get in touch with us today on 020 8610 9182 for house clearance services of the highest quality in KT5. Hire the services of our house clearance company in Berrylands, KT5 for a cheap solution to clutter. The details regarding the overall price of our services are mentioned on our official website. Our honest price range for all our various services will certainly be of great value for our clients. Hence you need not worry about extra charges and can safely use our services at a decent cost. The quote will be dispatched to you before the work gets started and we are sure you’ll be completely satisfied with the work done by our team. Call 020 8610 9182 now for budget-friendly house clearance KT5 services. The highly efficient services offered by our house clearance Berrylands crews can help you clear away junk, furniture, carpets, old electronic equipment and other materials that are occupying valuable space at your premises. Our friendly teams are the best to hire in KT5 and will make sure that all that your problems are solved at the earliest. The removed items will be donated to a charity or recycled depending on the quality and type of the items. Refunds are also provided in case of any mishaps or problems from our side. Thus you can depend on our KT5 house clearance crews for high quality work and results. Our house clearance company is a highly professional one in Berrylands with skilled members working to satisfy each and every need of the customer. 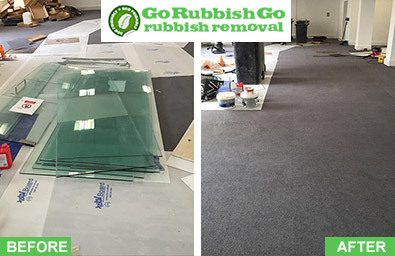 We are a fully insured company and our staff members are trained professionally for all the tasks they undertake. The vans used by our team are all the latest models and have high fuel economy characteristics, so we will not emit more harmful gases than absolutely necessary. We can also clear away stuff from your house even if you’re unable to be present on the site. Call 020 8610 9182 right away to hire us for your KT5 house clearance Berrylands. 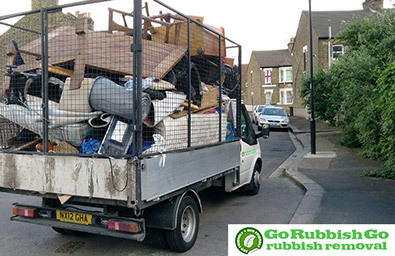 At Go Rubbish Go, we try our best to reduce the amount of items that are sent to the dump. We can carefully dispose of all the junk items in such a manner that they don’t harm the environment. Our Berrylands house clearance firm is fully licensed to handle and dispose all sorts of waste materials and household goods. Recycling of certain items will be done in order to ensure that the products are reused in an effective manner. We also use recyclable bags for collection and disposal. This can ensure that only eco-friendly products are used on a larger scale. Protect the environment by hiring our eco-friendly house clearance Berrylands, KT5 services. With the house clearance solutions we have available in the KT5 area, you’re always one phone call away from a neat and tidy home. We try to be as flexible as possible so that the services offered by us can be modified to suit your requirements. Our friendly team will ensure a stress-free service at a cheap price. So, all you need to do is contact us on 020 8610 9182 and mention your requirements. The best Berrylands, KT5 house clearance crew in will be at your service as soon as the order gets confirmed. Visit our website for more info or speak to our team for further assistance. Berrylands is a suburban development which falls under the Royal Borough of Kingston upon Thames in South West London. This area is known for its modern housing developments. Shop parades were built in several areas including Berrylands Road, Alexandra Drive, Surbiton Hill Park and Chiltern Drive. A newsagent, a hairdresser, a beauty salon, a coffee shop, a CCTV shop and a bookshop can be found in this area too. The chief attractions that can be seen nearby include the Coronation Stone, Chessington World of Adventures, Kingston Museum and the Rose Theatre. Richmond Park and Bushy Park can also be found close by. Both road and rail transport is available. Bus routes link Berrylands to several places in Central London. The nearest station is Berrylands railway station.